If one of your fruit trees dies a wintry death, but the yank test says there's still life left in the roots, you can choose to either wait a year and then graft onto that rootstock, or to turn the area into a rootstock-propagation zone. I opted for the latter with the winter-killed apple tree shown above. 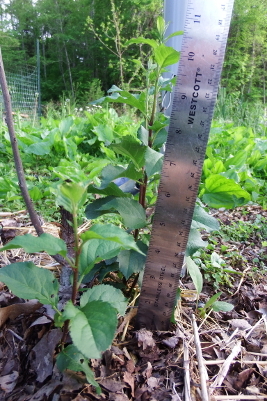 If you're interested in propagating apple rootstocks, you should read this post first since it explains the whys and hows of stooling. Do it now. I'll wait. Are you back? Okay, so you'll notice that my winterkilled apple sent up five sprouts of various sizes from the rootstock (the largest four of which you can see in the photo above). The Grafter's Handbook recommends waiting until those sprouts are five to six inches tall (I waited a bit too long), then hilling them up just like you would a bed of 'taters. The idea is to cover about half of each sprout's length with earth, and it's worth taking some time to work the soil in with your fingers to thoroughly fill all the air gaps between sprouts. 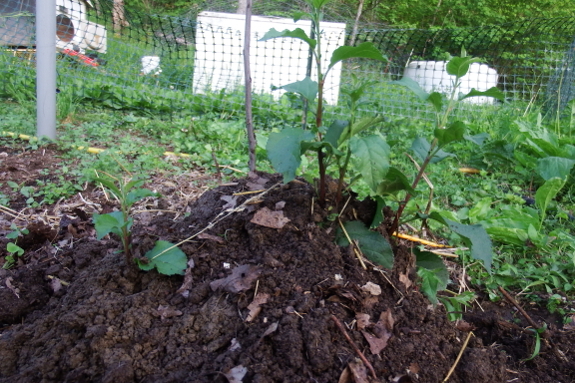 Once the sprouts grow a little higher, I'll hill a little more so I continue to have half of each stem's length (hopefully six to eight inches by the end of the season) buried in the soil. 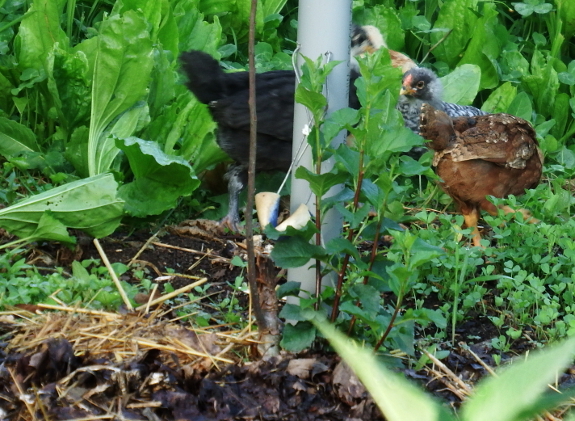 Varieties are chosen to be rootstocks in part because they're keen rooters, so in my official stooling areas, I chopped the tops off the one-year-old trees in early spring and stuck those tops halfway into the ground several inches away from the original stool. 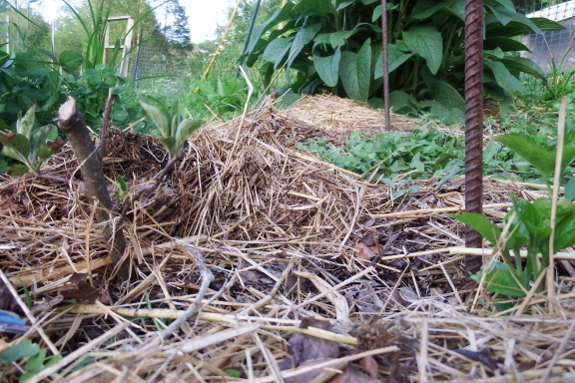 In the photo above, the stem is on the left and the rootstock is on the right (by the rebar). As you can see, both parts of the tree are currently leafed out and growing. Since this stool is younger than the one shown in the previous photos (one year old versus 2.5 years old), it's not as advanced and won't be hilled for a few more weeks. The good news is that it looks like, if everything goes smoothly, I won't have to buy apple rootstocks this year. Now, the question is, where will I put another half dozen home-grafted apple trees?